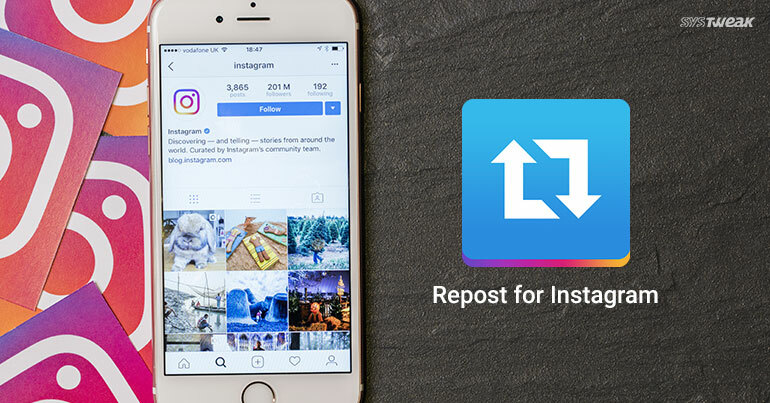 Here Is How You Can Repost Your Instagram Photos! Howdy Instagrammers? Agree or not, but the web of social media has got a huge hold on our lives. Be it the early morning snapping or scrolling the Facebook wall for never ending news feed. Talking about social media, not taking Instagram’s name would be kinda unfair, right? While scrolling through your Instagram account, you must’ve often noticed a repost icon on various pictures? For those of you who are not aware, Repost allows you to share other people’s post on your account. Suppose your friend just posted your favorite picture before you did, then you can simply share it on your account as well. However, to do this, Instagram doesn’t offer us any inbuilt option or button which directly shares other people’s pictures on your account. So, for this you need to install a third party application named “Repost”. The application is secure and fully compatible with Instagram, available for both Android as well as iOS. Before you begin just make sure you have already installed the “Repost for Instagram” app from the respective app store. If not then you can download it here for iOS and Android. Launch Instagram and head on to the post which you want to share on your account. Now tap on the three dots icon on the top right corner of the post. Now select “Copy Share URL”. Now open the Repost app and here you will see the post under “New” section. You don’t have to explicitly paste the URL which you copied on Instagram. You can also use the buttons at the bottom of the screen to reposition and change the color of the watermark. Once you’re done tap on the “Repost” button on the bottom of the screen. On the popup sharing menu, select “Copy to Instagram.” This opens the post in Instagram’s editor. Now the steps stay moreover the same like you usually do to share your posts. You just have to add your favorite filters and the Repost app will automatically add the caption from your friend’s post. Finally, to repost the image, tap “Share” and the image will be reposted from your account. Almost all social media platforms allow you to share your friend’s or other people’s post on your account. We just hope Instagram adds a Repost button soon, so that sharing can become quite easy. Till then you can take use of this process, follow the above mentioned steps and share any account’s content on your account!